North Korea offered the international press a first look at a new intermediate-range ballistic missile during a military parade on Sunday celebrating the 65th anniversary of the Workers Party. The missile has a range of 3,000 to 4,000 km, making it capable of reaching the strategic U.S. military base in Guam. The missile has been dubbed "Musudan" by the U.S. intelligence services. 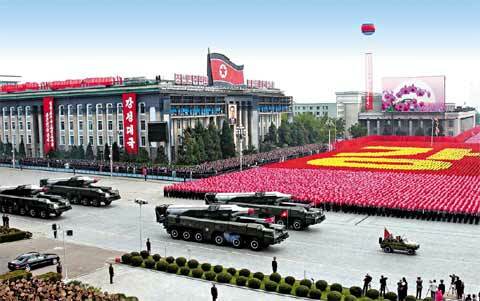 Its existence was confirmed in the early 2000s, and its first public appearance was a parade celebrating the foundation of the North Korean military in April 2007, but no pictures were available until Sunday. About a dozen of the missiles are apparently stationed at missile bases in Yangdok, South Pyongan Province, and Sangnam-ni, Hochon, North Hamgyong Province. The missile is 12 m long and 1.5 m wide and has the longest range in North Korea, outdoing the Rodong missile, which has a 1,300 km range.